We provide complete technology for a Technical Know how Producing Alpha Plaster, type 3 & 4 production. 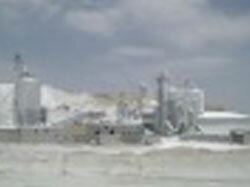 Gypsum when dehydrated under certain conditions produces , an important product called Plaster of Paris, which has innumerable number of application. Depending upon the technique, temperature, etc. different types of Plaster of Paris can be produced. Two forms of the Plaster of Paris are identified , namely a - and b form. Out of the two forms Alpha plaster has found superior strength and therefore it is preferred to beta plaster. Alpha plaster has specific uses in preparation of jigger moulds in the ceramic industry, as building blocks and partition wall, insulating board in building industry. In the field of structural decoration, Plaster of Paris is used in the formation of decorative friezes, coonics, columns and other decorative features in interior finishes. It is also used in certain smaller articles as furniture, clock frames and the like. In the dental trade, plasters are used in the making of impressions for dentures, in lay and for the casting of metal filling, bridges, etc. Art moulding includes the making of a great variety of art objects and novelties formed by the casting of gold, silver and other non- ferrous metals in plaster of Paris investment moulds. Plaster of Paris also finds a considerable industrial potential in the forming of non-ferrous metal objects and mechanical parts by plaster of Paris investment moulds. Plaster of Paris is also required by artisans and for temporary structure construction used in the film industry. The product is being produced by number of firms but the demand of the product is ever increasing since it has versatile application and is used all over the country and as well as abroad. Therefore, the process offers a very good prospect for entrepreneur for local as well as export markets. Alpha plaster can be used wherever low strength beta plaster is used. Because of its superior strength and subsequent increase of the life of the moulds, alpha plaster is preferred to beta plaster.